Einstein claimed that he derived the Lorentz transformation equations from his two fundamental postulates, and that such transformations in turn mathematically confirmed the validity of his two fundamental postulates, all of his coordinate measurements, and his twin concepts of the Relativity of Distance and the Relativity of Simultaneity. However, it will be demonstrated that such Lorentz transformations cannot be valid for any such reasons because, inter alia, they are completely ad hoc, they only result in gross approximations, they are restricted to inertial motions, and because all of Einstein’s postulates and assumptions upon which they were based are empirically invalid. It will also be demonstrated that Einstein did not really derive such transformations, but rather he borrowed them from Lorentz and merely put a different spin on them. A. Why did Einstein need to adopt Lorentz’s transformations? In the previous Chapter 26, we have demonstrated that relative motion (velocity) between two inertial frames was not necessary for Einstein to claim and attempt to explain his twin concepts of the Relativity of Simultaneity (duration) and the Relativity of Distance (length). All that was really necessary was the constant finite velocity of a light ray at c, relative distances and positions, clocks, and Einstein’s arbitrary concept of the ‘common synchronous time’ for each inertial system (Figures 26.7 and 26.8). Why then did Einstein insist upon illustrating such twin concepts with relative motion (velocity) between two inertial reference frames? The answer is quite simple. Without relative motion (velocity) between two inertial reference frames there could be no distorted coordinates of time intervals and lengths (Chapter 26), and there would be nothing to mathematically transform. Without distorted time intervals and distance intervals, and without distorted coordinates of different inertial reference frames to transform, there would be no need for the Lorentz transformations. Without the Lorentz transformations, Einstein could not mathematically claim and demonstrate that a light ray had an absolutely constant co-variant velocity of c for all inertial observers (Chapters 21E & 24); nor could he mathematically claim and demonstrate that all other physical phenomena were velocity dependent and consistent with his second postulate concerning the co-variant velocity of light. Why? Because only when such other phenomena were transformed with Lorentz transformations did their law change and did such changed laws became co-variant with respect to different inertial reference frames (Chapter 28). In fact, without the Lorentz transformations there would be no Special Theory of Relativity. As Bertrand Russell concluded, “[T]echnically, the whole of the special theory is contained in the Lorentz transformations” (Russell, 1927, p. 49). Thus, it becomes obvious that Einstein’s invalid twin concepts (the Relativity of Simultaneity and the Relativity of Length) were merely two stepping stones of false analogy, irrationalization and attempted justification on the path to his primary mathematical goal: the replacement of the Galilean transformation equations with the Lorentz transformation equations. “This [Lorentz] transformation has the advantage that it makes the velocity of light the same with respect to any two bodies which are moving uniformly relatively to each other, and, more generally, that it makes the laws of electromagnetic phenomena (Maxwell’s equations) the same with respect to any two such bodies. It was for the sake of this advantage that it was originally introduced…” (Russell, 1927, p. 49). In other words, Einstein desperately needed the Lorentz transformations in order to mathematically solve his “difficulties” (i.e. c – v and c + v), and to demonstrate the mathematical plausibility of his second postulate: “ [L]ight has a definite constant velocity of c for all spatially separated inertial observers, regardless of their different linear speeds” (Chapters 19, 20F, 21 and 22). Relative motion, or rather relative velocity, only became relevant for Einstein with respect to the Lorentz transformations…with their built-in factors for relative velocity, v and v2, and their bizarre mathematical consequences. Once the Lorentz transformations were rationalized and accepted, an uncountable number of hypothetical or imagined physical consequences could follow with mathematical precision, and relative velocity would become their magnitudes. The only constraints on this potentially unlimited invention of mathematical consequences were: 1) the ability to imagine and interpret mathematical consequences, and 2) the task of finding empirical phenomena or experiments which might somehow appear to relate to or appear to “confirm” such artificial consequences (Chapters 36, 37 and 38). “How have we to modify [the classical ‘addition of velocities’]…in order to remove the apparent disagreement between [the law of the propagation of light and the principle of relativity]…such that every ray of light possesses the velocity of transmission c relative to the embankment and relative to the train. “This question leads to a quite definite positive answer, and to a perfectly definite transformation law for the space-time magnitudes of an event when changing over from one body of reference to another” (Ibid). This “transformation law,” of course, turned out to be “the Lorentz transformation equations,” which are described in Chapters 16 and 27B of our treatise, and in Chapter 11 of Einstein’s book, Relativity (Einstein, Relativity, p. 37). What a surprise! B. How did Einstein “derive” his Lorentz transformation equations? In Section 3 of his 1905 Special Theory, Einstein invented a new thought experiment. He theoretically established two inertial reference frames (coordinate systems), S and S′, that coincided at the same point of origin (Figure 27.1A). Each system was provided with a rigid measuring rod, a number of identical clocks, a light source at one end and a mirror at the other end. System S′ then accelerated to a uniform inertial velocity vrelative to system S (Figure 27.1B). The “common synchronous time” t′ for system S′ was then determined by light signals, and likewise a different “common synchronous time” t for system S was also determined by light signals. Therefore, the coordinates x, y, z, t “completely defines the place and time of an event in …system” S, and the coordinates x′, y′, z′, t′ completely define the place and time of the same event in system S′, and vice-versa (Einstein, 1905d [Dover, 1952, p. 43 – 44]). Einstein then stated, “[O]ur task is now to find the system of equations connecting these quantities [x, y, z, t and x′, y′, z′, t′]” (Ibid, p. 44). Einstein then theoretically emitted a light ray from the origin O′ of system S′ (E1), which light ray propagated from E1 at clock time t′0 to mirror M′ (E2) at clock time t′1 and reflected back from mirror M′ to the light source at clock time t′2 (E3) (Figure 27.1B), According to his second postulate concerning the absolutely constant velocity of light at cand his algebraic definition of clock synchronization, t′1 = ½(t′0 + t′2), Einstein determined that for an observer in S′ the velocity of light measured by synchronized clocks in system S′ was c (Ibid, p. 44; Miller, p. 196). However, when an observer in system S measured with coordinates the events E1, E2 and E3 in distant system S′ uniformly moving at v relative to S, the algebraic time interval of light propagation from coordinates 0 – 10 became c – v in S, and the algebraic time interval of light propagation from coordinates 10 to 0 became c + v in S. These different velocities of light were merely relative velocities when measured in S, which resulted because of the relative motion of S and S′ (x = x′ + vt and x′ = x – vt) ( Miller, p. 197). In other words, the tip of the light ray was displacing at v relative to S (because of the relative motion between S and S′), but it was not displacing relative to S′. The light ray was emitted and always propagated over the same distance to and fro within S′. However, Einstein interpreted his thought experiment much differently. He concluded that such light ray was measured in system S′ to propagate at velocity c, but “when measured in the stationary system [S, such ray moved] with the velocity c – v…” (Einstein, 1905d [Dover, 1952, p. 45]; Figure 27.1A). This asymmetric algebraic result violated both Einstein’s principle of relativity (vis. that the laws of physics are the same [algebraically co-variant] for every inertial observer), and it also violated Einstein’s second fundamental postulate (vis. that the absolutely constant velocity of a propagating light ray is crelative to all inertial observers, regardless of their different linear speeds). On the other hand, what other result could anyone expect, where one constant velocity c is compared to another constant velocity v in two different reference frames and in two different directions? The results c – v and c + v were nothing more than the constant transmission velocity of a light ray at c in system S′ propagating in two different directions with respect to the constant relative velocity vbetween two bodies, S and S′, as measured by coordinates in S. Thus, c – v and c + v were merely relative velocities of the light ray measured by S as theoretically increasing coordinates (Figure 27.1C). They were not different transmission velocities of the light ray, as Einstein was asserting. At this juncture, Miller cautions the reader that Einstein was still dealing with an “intermediate Galilean system,” and that he “avoided discussing a contraction of length because…Einstein could not deduce this contraction [effect] until after he derived the [Lorentz] space and time transformation equations” (Miller, pp. 196 – 197). This conclusion by Miller shows that Einstein knew at this early point in his so-called “derivation” exactly what Lorentz transformation equations he was supposedly “deriving.” As Folsing strongly implies in Chapter 27C to follow, Einstein was not really deriving the Lorentz transformations from his two fundamental postulates as he claimed, because at an early and “opaque” point in his derivation he already knew what such transformations had to be. In other words, in Section 3 of his Special Theory, Einstein was really “contriving” his Lorentz transformations. “[A]ny ray of light, measured in the moving system, is propagated with the velocity c, if, as we have assumed, this is the case in the stationary system…[so] that the principle of the constancy of the velocity of light is compatible with the principle of relativity” (Ibid, p. 46). In other words, such denominator was necessary for Einstein so that when the law for the velocity of light at c is transformed from coordinates x, y, z, t to coordinates x′, y′, z′, t′ or vice-versa, it will retain exactly the same algebraic form c in both frames of reference; or in brief, so that such law of velocity c will be “co-variant with respect to the Lorentz transformations” (Einstein, Relativity, pp. 47, 48). (Ibid, p. 37; Einstein, 1905d [Dover, 1952, pp. 46, 48]; Miller, pp. 195 – 200). At this point, Miller concluded, “It seems as if he [Einstein] knew beforehand the correct form of the set of relativistic transformations…” (Miller, p. 200). Note that, for the sake of simplicity, a good deal of Einstein’s algebraic progression was omitted by the author in arriving at such Lorentz transformations, because it is not relevant to our discussion. It is obvious from the above discussion that Einstein “derived” or “contrived” his Lorentz transformations solely based on measurements from a theoretical ether, inertial frames of reference, coordinates, synchronized clocks, light signals, relative velocity, his second postulate concerning the absolutely constant velocity of light at c, and algebra. They are not empirical transformations deduced from observation or experiments. Einstein’s first postulate concerning his principle of relativity played no active part in such process; it merely served as his interim goal. Once in possession of his Lorentz transformations, Einstein mathematically demonstrated his concept of contraction of matter depending upon its relative velocity, and that his Lorentz transformations were reciprocal with respect to S and S′ (Einstein, 1905d [Dover, 1952, pp. 46 – 48]; Miller, p. 202). Nevertheless, the facts that Einstein mathematically “obtained” this Lorentz transformation, that his two invalid fundamental postulates are mathematically compatible, or that the Lorentz transformations are mathematically reciprocal between two inertial reference frames, does not mean that such Lorentz transformations have any empirical validity with respect to physical phenomena or physics. As we have demonstrated and will further demonstrate over and over in this treatise, such Lorentz transformations are completely ad hoc, artificial, and have absolutely no physical meaning whatsoever (Chapters 15, 16, 27 and 28). They only algebraically serve to artificially eliminate the distance/time intervals and the velocity v between the two co-moving reference frames S and S′ so that the coordinate magnitudes of physical phenomena will mathematically be co-variant, or the same, when translated from one to the other, and in the process they radically change the coordinate magnitudes of such phenomena and the laws of physics (Einstein, Relativity, pp. 47 – 48; Hoffmann, p. 87; Feynman, 1964, pp. 25-1 and 25-11; Russell, 1927, p. 49). The most fundamental problem with Einstein’s so-called mathematical “derivation” of the above Lorentz transformation equations was that his second postulate for the absolute constancy of the velocity of light… “that light is always propagated in empty space with a definite velocity c”…is a totally incorrect concept when applied to linearly moving bodies. This was a major primary false premise in his “derivation.” As we explained in great detail in Chapter 21, a light ray always transmits at Maxwell’s constant velocity of c with respect to its medium of empty space or a vacuum, but relative to an inertial frame linearly moving at velocity vwith respect to such light ray it propagates over changing distances at the relative velocity of c ± v during changing time intervals of ct ± vt.
A second major false premise in Einstein’s so-called mathematical derivation of the Lorentz transformations was his assumption (based on the ether theory) that light propagating in S′ has a greater distance to propagate in the direction of motion when measured from S.
A third major false premise in Einstein’s so-called derivation of the Lorentz transformations was Einstein’s algebraic measurement of the propagation of light in system S′ as viewed from system S (Figures 27.1A and 27.1B). The constant transmission velocity of light at c did not change to c ± v in his examples for two reasons: 1) the mirror in S′ did not physically displace from the light source in S′ nor from the tip of the propagating light ray, nor did such light source physically change its position relative to the propagating light ray, as the measurement in S asserts. They were both relatively stationary (Chapter 12); 2) the algebraic measurements of c – v and c + v from system S were merely relative velocities of propagation because of such relative motion of the two reference frames. A fourth false premise was Einstein’s belief that any principle of relativity could apply to light. Because the transmission velocity of light at c was stipulated by Maxwell to be constant relative to its medium of a vacuum, such velocity is automatically invariant at any point in any empty space. Therefore, any principle of relativity, any concept of co-variance, and any set of transformation equations were automatically irrelevant to such constant, abstract, absolute, and invariant velocity of light at c.
A fifth false premise in Einstein’s “derivation” was that an inertial reference frame has a ‘”common time” for every spatially separated point and for every spatially separated inertial observer with a synchronized clock in such frame (Chapter 25). These artificial concepts and Einstein’s arbitrary use of them also aided him to mathematically “derive” his Lorentz transformations. A final contradictory problem with Einstein’s derivation is that in order for his postulate of the absolutely constant transmission velocity of light at c to empirically work (regardless of the linear motions of any observer), all bodies and all observers in the universe would have to remain absolutely stationary…forever. But, of course, this does not empirically occur. Even in Einstein’s Section 3 thought experiment, system S′ and such light ray propagating to and fro in system S′ were moving linearly at v relative to system S (and its observers with synchronized clocks), so very naturally the propagation velocity of the light ray moving away from S in S′ was measured in S to be c – v (Figure 27.1). For all of the above reasons, Einstein’s Lorentz transformation equations were not only irrelevant and unnecessary…they were also invalid and meaningless. C. Did Einstein really “derive” his Lorentz transformations? We now turn to the question: How did Einstein really obtain his Lorentz transformations? In his 1916 book, Relativity, Einstein claimed that he “obtained” the Lorentz transformation by uniting his two postulates: his radically expanded “principle of relativity” and his absolutely constant transmission velocity of light at c in vacuo (Einstein, Relativity, p. 47). The method that Einstein allegedly used to obtain or “derive” his Lorentz transformation equations is set forth in his 1905 paper (Einstein, 1905d [Dover, 1952, pp. 43 – 48]), and briefly described in the previous Section B of this chapter. “Einstein must have begun with some idea of what he wanted to deduce. At an opaque point in his deduction he introduces, without any warning or explanation, a slight mathematical operation whose purpose becomes obvious only if the desired result is already known. This underhand device, by means of which he rather forcibly “computes his way” to the Lorentz transformations, deprives thededuction of some of its elegance and stringency. Thus it is scarcely credible that Einstein actually arrived at his formulas in the way he presents them in his paper” (Folsing, p. 188). Miller mirrored these conclusions: “It is difficult to imagine that Einstein first derived the relativistic transformations by the method described in the 1905 paper; in fact, he never used this method again” (Miller, p. 204). There was another much more convenient and more logical source for Einstein’s Lorentz transformation equations other than such derivation. That was Lorentz’s April 1904 treatise which first publicly introduced his Lorentz transformation equations. It is obvious to some skeptics, including the author, that Einstein read Lorentz’s April 1904 treatise shortly after it was published in April and June of 1904. By July 31, 1904, German scientists Kaufmann and Abraham had found Lorentz’s April 1904 treatise on their own and Abraham had replied to it in a published article (Miller, p. 70). If they could find Lorentz’s April 1904c transformation treatise and reply to it within 3 months, why couldn’t Einstein, who was also intensely interested in the subject? Once Einstein found and read Lorentz’s April 1904 treatise, he realized that its Lorentz transformations had “the advantage that it makes the velocity of light the same with respect to any two bodies which are moving uniformly relatively to each other,” as Bertrand Russell so aptly described (Russell, 1927, p. 49). This Lorentz transformation would mathematically solve the paradox concerning the constancy of the velocity of light at c, relative to linearly moving material bodies, which Einstein had been pondering about for almost a decade. But Einstein, quite naturally, did not want anyone to know that he had merely copied Lorentz’s transformation equations and put a different spin on them. So he contrived an elaborate subterfuge of inventing two postulates and a kinematic theory based on such transformations, which would allow him to claim a “derivation” of such Lorentz transformation equations on his own. In fact, Lorentz was led to conclude and assert the next year (in 1906) that, “Einstein simply postulates what we have deduced, with some difficulty…” (Folsing, p. 215). In other words, Einstein in 1905 plagiarized Lorentz’s April 1904 treatise and used its concepts in his Special Theory as his own, albeit with a different spin. Einstein was forced to continue this subterfuge until his death in 1955, because the alternative would have ruined his reputation and cast great doubt on the crowning achievement of his life: Special Relativity. In 1954, Einstein acknowledged that in 1905 he “knew Lorentz’s important treatise of 1895.” But (in 1954) he claimed that in 1905 he did not know of “Lorentz’s later work” after 1895, which would include Lorentz’s extensive April 1904 treatise containing the concepts of and formulas for the Lorentz transformations, Lorentz’s analogies of a sphere contracting into an ellipsoid, and Lorentz’s modified concept of ‘local time,’ among others (Folsing, p. 168). These 1954 claims by Einstein are also “scarcely credible” for the following additional reasons. Folsing concludes that Einstein “must have known a lot more than only Lorentz’s versuch of 1895” (Folsing, p. 168). For examples, Einstein poured over Poincaré’s 1902 book, Science and Hypothesis, for weeks (Pais, pp. 133 – 134), which book mentions Lorentz’s work, the concepts of relative motion, relative velocity, relative time, simultaneity, and Poincaré’s new and expanded “principle of relativity” (Poincaré, 1902, pp. 90, 111 – 114, 242 – 244). In early 1904, Lorentz published a long and important paper in a well-known German mathematics and scientific journal, which paper was entitled “World Picture of Maxwellian Theory. Electronics Theory.” Such paper referred to Lorentz’s upcoming 1904 transformation treatise, wherein he would systematically deal with second-order electrodynamic effects (Miller, pp. 66, 403). All of these subjects were of vital interest to Einstein. On April 23, 1904 Lorentz’s transformation treatise (written in Dutch), which contained his Lorentz transformations, was published (Ibid, p. 66). Einstein could read the Dutch language. On May 27, 1904, an English version of Lorentz’s April 1904 treatise was also published (Ibid). Abraham’s 1904 published response to Lorentz’s April 1904 transformation treatise and Abraham’s follow-up paper described and critiqued Lorentz’s April 1904 transformation treatise (Miller, pp. 70 – 71). In 1904, Emil Cohen discussed Lorentz’s April 1904 modified version of “local time” in scientific literature (Ibid, pp. 171, 202). In September 1904, Poincaré addressed a group of scientists at the St. Louis World’s Faire and described Lorentz’s April 1904 transformation theories in detail (Miller, p. 74; Pais, pp. 127 – 128). In December 1904, Lorentz published another widely read article, which further discussed his prior April 1904 theories and transformation equations (Miller, p. 71). In January 1905, Abraham published a widely read German textbook on Electromagnetic Theory, which further discussed Lorentz’s April 1904 theories and transformation equations (Ibid, p. 72). Poincaré’s June 5, 1905 paper on the Dynamics of the Electron, which critiqued Lorentz’s April 1904 transformation treatise, made frequent and specific reference to Lorentz’s 1904c transformation paper, (Pais, pp. 128 – 129), and Einstein could read the French language. Numerous other scientists and writers discussed Lorentz’s April 1904 transformation treatise in scientific journals during this period. Einstein would have had to be deaf, dumb, blind and unconscious not to have discovered and read Lorentz’s April 1904 transformation treatise (which contained his Lorentz transformations) before June 30, 1905. Lorentz was an inspirational mentor for Einstein, and Einstein read many of Lorentz’s other works. Lorentz’s April 1904 transformations and other of his April 1904 concepts are strewn all over Einstein’s 1905 Special Relativity paper. These other concepts included, inter alia, Lorentz’s analogies to deformable spheres contracting into ellipsoids in the direction of motion (Chapter 26A), Lorentz’s modified concept of local time (Chapters 16 and 26), and Lorentz’s concepts that electromagnetic mass increases with velocity (Chapter 32). Einstein never specifically denied Lorentz’s 1906 accusation concerning plagiarism. In his 1907 “Jahrbuch” paper, Einstein acknowledged that in 1905 he knew about Lorentz’s modified concept of “local time,” which appeared for the first time in Lorentz’s April 1904 treatise (Einstein, 1907 [Collected Papers, Vol. 2, p. 253]). 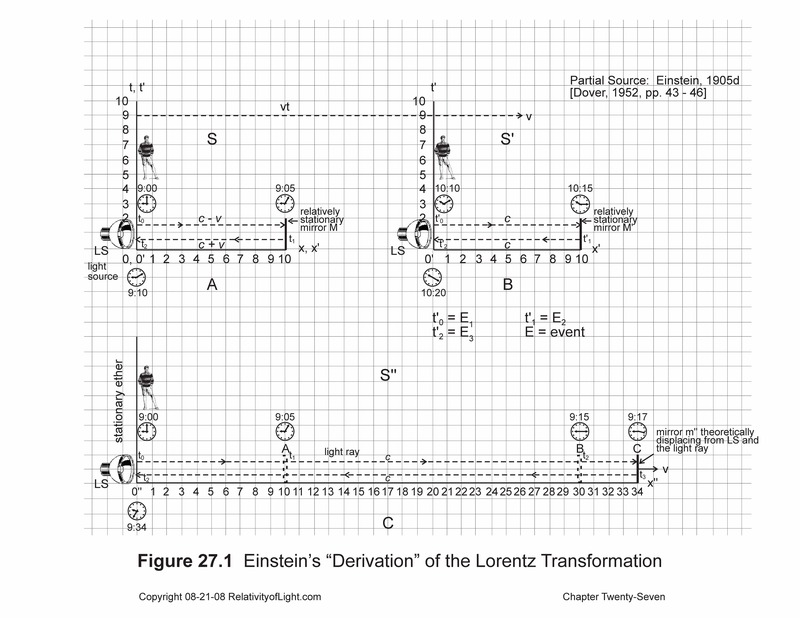 How could Einstein not have found, read and copied Lorentz’s April 1904 transformation treatise before June 30, 1905? in the denominator of such equations, and they result in many of the same bizarre mathematical consequences as Lorentz arrived at in his April 1904 transformation treatise (Lorentz, 1904 [Dover, 1952, pp. 11 – 34]). D. Are Einstein’s Lorentz transformations valid for all or even for any physical phenomena? In early 1955, Einstein claimed in a letter (to Carl Seelig) that his Lorentz transformations (and thus his two fundamental postulates) “transcended its connection with Maxwell’s equations and was concerned with the nature of space and time in general” (Einstein, 1955 [Miller, p. 195]). In such letter, Einstein also claimed that: “the ‘Lorentz invariance’ is a general condition for any physical theory” (Ibid). Could these radical generalizations by Einstein be correct? We have already demonstrated that Lorentz’s ad hoc April 1904 transformations were premised upon the invalid concept of ether, and for this reason they, too, were invalid and meaningless (Chapters 15 and 16). Therefore, if Einstein merely copied them and gave them a new theoretical spin, such transformations must also remain ad hoc, invalid and meaningless for Einstein’s Special Theory and for science in general. Even assuming that Einstein might actually have derived the Lorentz transformations from his two fundamental postulates, does this mean that such transformation equations are generally valid for physical science? Of course not. We have already demonstrated in prior Chapters that Einstein’s two fundamental postulates were also ad hoc, invalid, and meaningless, so anything based or premised on them should suffer the same fate. (Figure 15.6). If the denominator was interpreted to become smaller than the number one depending upon the velocity v of the sphere (which would be normal mathematical interpretation), then the entire set of Lorentz transformations could quite logically be interpreted to mean that when the numerator is divided by a smaller denominator the sphere gets larger and the distance vt between x and x′ expands (rather than contracts), and that the time interval between x and x′ also expands (which of course would not be relativistically reciprocal). If these different assumptions and interpretations were described as postulates, then the Lorentz transformation equations for both time and space could be “derived”’ from them. The author is confident that any imaginative pure mathematician could also come up with other very different assumptions, and could also “obtain” the same Lorentz transformation equations from them, albeit they might be interpreted quite differently. In fact, by 1905, similar mathematical scenarios had already occurred at least four times. In 1887, Woldemar Voigt invented an early version of the Lorentz transformations and from them he supposedly derived the classic Doppler shift. Voigt also noted that space and time transformations of this type result in invariant values for electromagnetic equations (Pais, p. 121). In 1899, Lorentz used assumptions based on the M & M null results in order to construct his Lorentz transformations, so that he could mathematically explain such null results in terms of the ether theory (Ibid, p. 125). Joseph Larmor then independently obtained the same transformations by 1900 in order to support his own proof of the Fitzgerald contraction (Pais, p. 126). Lorentz then reinvented or resurrected his Lorentz transformations in April 1904 in order to mathematically explain and justify the null results of first and second order electromagnetic experiments at any velocity (Ibid; Lorentz, 1904c [Dover, 1952, pp. 11 – 34]). Thereafter, Einstein discovered Lorentz’s April 1904 treatise (which contained the so-called Lorentz transformations), and applied such Lorentz transformations to his Special Theory along with new ad hoc interpretations (Chapter 27C). Einstein asserted that: “once in possession of the Lorentz transformation…we can combine [c] with the principle of relativity, and sum up the theory thus…General laws of nature are co-variant with respect to Lorentz transformations” (Einstein, Relativity, pp. 47 – 48). Einstein then claimed, “If a general law of nature were to be found that did not satisfy this condition, then at least one of the two fundamental assumptions [postulates] of the theory would have been disproved” (Ibid, p. 48). Well, a general law of nature has been found which empirically is not algebraically “covariant with respect to Lorentz transformations.” That is Maxwell’s general law of the constant transmission velocity of light at c in vacuo, relative to its medium of a vacuum in empty space. Empirically and by definition, Maxwell’s constant transmission velocity of light at c relative to its medium of a vacuum never varies…it is automatically invariant and velocity c with respect to any frame of reference (Chapters 6, 9 and 21D). 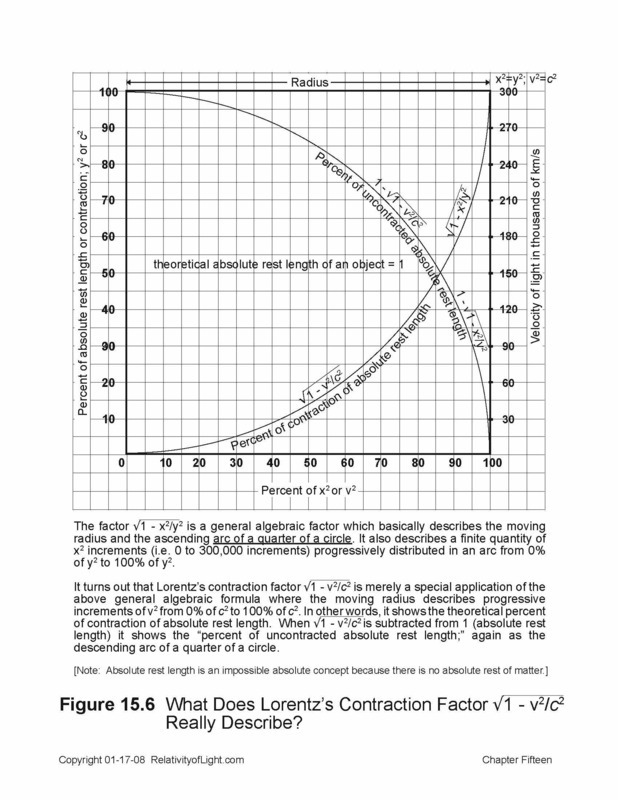 For this reason, the Lorentz transformations are unnecessary and irrelevant to the constant transmission velocity of light at c relative to its medium of a vacuum in empty space. Thus, by Einstein’s own words, his second fundamental assumption (postulate) concerning the absolutely constant velocity of light at c relative to linearly moving inertial bodies has been empirically disproved. Einstein also asserted that: “Every general law of nature must be so constituted that it is transformed into a law of exactly the same [algebraic] form…” (Ibid, p. 47). But an invariant law, such as Maxwell’s constant transmission velocity of light at c relative to its medium of a vacuum, cannot be algebraically changed or transformed (from algebraic form c into algebraic form c) by any transformation equation (Lorentz or Galilean). It is already and always will be the same form in all inertial reference frames, and its constant emission and transmission magnitude of velocity always remains invariant at c relative to its medium of empty space. Maxwell’s invariant law of velocity c in a vacuum must never be transformed or otherwise mathematically changed. For all of the above reasons, Maxwell’s general law concerning the constant transmission velocity of light at c does not meet Einstein’s test of “co-variance with respect to the Lorentz transformations.” Therefore, both of Einstein’s two fundamental assumptions of his Special Theory have once again been “disproved.” His fundamental assumption concerning the propagation velocity of light at c (contained in the first part of his second postulate) is not empirically valid (Chapters 21 and 22). Einstein’s first postulate—that his expanded principle of relativity and its Lorentz transformation equations apply to all general laws of nature—is also not empirically valid. Why? Because the inherent and invariant transmission velocity of a light ray at c also empirically becomes a relative velocity of c – v and c + v when it propagates with respect to bodies moving linearly at v, but the invariant transmission velocity of c (Maxwell’s law of nature) cannot be algebraically and covariantly transformed by Lorentz transformations from one inertial frame to all other inertial frames and still remain physically and empirically valid. The same is true of other physical phenomena such as length, mass, time, energy, electricity, etc. As we demonstrated in Chapter 26 and will further demonstrate in Chapter 28, length and time are not really relative quantities, the magnitudes of which are dependent upon the relative velocity of a body. On the contrary, the magnitudes of these quantities are physically and empirically completely independent of any velocity. We will also discover in Chapters 31 through 35 that the same is true of matter, material mass, force, momentum, energy, electricity, and all other physical phenomena, including quantum physics and atomic particles. These phenomena and the magnitudes of their quantities are also independent of any relative velocity. Einstein only conjectured and asserted that such physical phenomena were velocity dependent (and applied the Lorentz transformations to them) so that they would all appear to be consistent with his absolutely constant propagation velocity of light at c relative to linearly moving bodies. However, strangely enough, the only velocity dependent phenomenon is such propagation velocity of light at c ± v relative to linearly moving bodies, which Einstein artificially and mathematically made velocity independent (impossibly physically invariant and algebraically co-variant) by his misapplication of the Lorentz transformations. The conclusion is obvious: Einstein’s Lorentz transformation equations are completely contrived, ad hoc and meaningless, not only for the velocity of light, but also with respect to all other physical phenomena. The Lorentz transformations only mathematically distort all of these physical phenomena, and thus also much of empirical physics. E. General conclusions concerning Einstein’s Lorentz transformations. Let us now briefly reiterate how we got from the “difficulties” contained in Chapter 19 to Einstein’s Lorentz transformations, which are the subject of this chapter. When Lorentz and Einstein later misapplied the Lorentz transformations to the transmission velocity of light at c in two different reference frames separated by the relative velocity v, Maxwell’s equations remained the same in both frames. Why? Because the Lorentz transformations algebraically eliminated the relative velocity v between the two inertial reference frames (Hoffmann, 1983, p. 87), and along with it they automatically eliminated the relative time interval and distance interval between the two reference frames. The mathematical result was that the magnitude of a propagating light ray’s velocity was changed to c with respect to both inertial reference frames at the same instant (which Einstein called “co-variant”), rather than the very natural relative velocities of c ± v.
“[I]f one applied the Galilean transformation to the unprimed Maxwell equations, the resulting primed equations had additional first-order terms involving v/c and second-order terms involving v2/c2 …[But then] if one applies the Lorentz transformation [to Maxwell’s equations]…the primed equations, except for the primes, turns out to be exactly the same as the unprimed equations. No additional terms of any sort—first order, second order, or any other—enter the transformed equations” (Hoffmann, 1983, p. 87). “It is just a trick…When you unwrap the whole thing, you get back where you were before” (Feynman, 1964, p. 25-11). “Technically, the whole of the special theory is contained in the Lorentz transformation. This transformation has the advantage that it makes the velocity of light the same with respect to any two bodies which are moving uniformly relatively to each other, and, more generally, that it makes the laws of electromagnetic phenomena (Maxwell’s equations) the same with respect to any two such bodies. It was for the sake of this advantage that it was originally introduced…” (Russell, 1927, p. 49). In other words, the algebraic change of c to c ± v caused by the misapplication of the Galilean transformations to Maxwell’s equations was mathematically reversed by the mathematical trick of applying the Lorentz transformation equations. It is just that simple. However, in the process the Lorentz transformations created many more consequential blunders and theoretical distortions when they were thereafter deemed to apply to all of physics and were misapplied by Einstein and his followers to all other physical phenomena, such as length, time, mass, and Newton’s equations for mechanics. In effect, they mathematically changed the laws of such physical phenomena and artificially made them velocity dependent. This arbitrary generalization was only made in order to make Einstein’s Special Theory (and especially his second postulate concerning the velocity of light at c) appear to be mathematically consistent with all of physics. But it did much more. “In the theory of relativity, Einstein asks us to agree that a certain finite invariant velocity which turns out to be that of light in vacuo must be considered invariant for all Galilean [inertially moving] observers” (D’Abro, 1950, pp. 161 – 162). “Now it is obvious at first sight that if our space and time measurements were such as classical science believed them to be, it would be impossible for a ray of light to pass us with the same speed regardless of whether we were rushing towards it or fleeing away from it. A simple mathematical calculation shows us, however, that we can make our results of measurement compatible with [Einstein’s] postulate of invariance provided we recognise that our space and time measurements are slightly different from what classical science has assumed. This is purely a mathematical problem and can be solved by mathematical means. It leads us, of course, to the Lorentz-Einstein transformations, and from these transformations it is easy to see that rods in relative motion must be shortened, durations of phenomena extended, and the simultaneity of spatially separated events disrupted” (Ibid, p. 162). “All of the laws of physics are invariant under the Lorentz transformation” (Feynman, 1964, p. 25-11). “Every law of physics…must have the same invariance under the same transformation” (Ibid). “The laws of physics must be such that after a Lorentz transformation, the new form of the laws looks just like the old form” (Feynman, 1964, p. 25-1). In light of the above discussions, why must we believe that all of these mathematical tricks and conclusions by Feynman are true? Because, states Feynman, it was found by the M & M experiments and by all other ether drift experiments that Maxwell’s equations (and specifically that the transmission velocity of light at c) was invariant“ in all inertial systems” (Feynman, 1964, p. 25-11). However, we now know from the discussions of many prior chapters that inertial systems and the Lorentz transformations had absolutely nothing to do with such invariance. The constant transmission velocity of light at c relative to its medium of a vacuum in empty space is inherently always velocity c and invariant everywhere (Chapters 6, 9, 21 and 22). For all of the above reasons, Einstein’s Lorentz transformations are completely ad hoc, arbitrary, invalid and meaningless for any reason, and especially with respect to his Special Theory and with respect to all physical phenomena (including the transmission velocity of light).